The European Union and Britain on Friday called for Myanmar leader Aung San Suu Kyi to intervene after an appeal from two Reuters journalists was rejected. A Myanmar court earlier on Friday ruled against Wa Lone, 32, and Kyaw Soe Oo, 28, who in September were both sentenced to seven years in jail on charges of breaking the country's Official Secrets Act — a legal relic of British colonial rule. 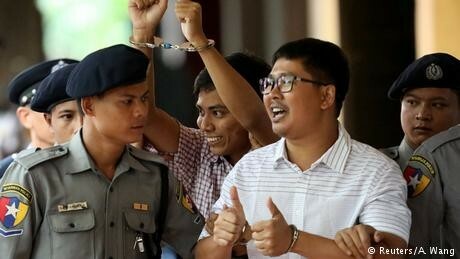 "Today's court decision to confirm the conviction of Reuters reporters Wa Lone and Kyaw Soe Oo to seven years' imprisonment is a missed opportunity to right a wrong," an EU spokesperson said in a statement. "We are very worried about due process in this case," British Foreign Secretary Jeremy Hunt told BBC radio when asked about the case. "We urge Aung San Suu Kyi to look at whether that due process happened and to recognise that, as someone who fought for democracy in Burma, she should be taking a personal interest in the future of these two brave journalists." High Court Judge Aung Naing said the seven-year prison term was "a suitable punishment"
Wa Lone and Kyaw Soe Oo were arrested on December 12 in Yangon for allegedly possessing "important secret papers" related to the ongoing crisis in Rakhine state, which they say they acquired from two policemen. They argued that they had been framed by police officers who handed them official documents in a Yangon restaurant before arresting them. Both plead not guilty to violating the Official Secrets Act and testified they received harsh treatment during their initial interrogations. Several appeals for release have been denied. A series of coordinated attacks on Myanmar police posts in western Rakhine State led the military to launch the violent crackdown on the Rohingya people on August 25 last year, driving more than 700,000 Rohingya into Bangladesh, including at least 370,000 children.